We are heading near the end of season 2 and the Legends are seeking the piece of the spear that the Legion has. This brings the Legends to the Vanishing Point, the only place the Legion can operate outside of time. At the Vanishing Point, Rip and Firestorm go one way while Sara and Mick go another. The latter two end up at the point where Snart sacrificed himself towards the end of season 1. Mick has memories of that moment and Sara reassures him that Snart gave up his life to save them. Meanwhile, Rip and Firestorm use their part of the spear has a homing beacon to find the other piece. The two are lead to some mini tower that is encasing the piece. Firestorm turns the tower into jelly beans and they get the final piece. Elsewhere, the Atom is keeping an eye on Thawne to make sure the mission can be completed. But once Rip and Firestorm take the piece, Thawne gets alerted but he is too late as the Legends are back on board the Waverider. Once back on board the Waverider, the pieces of the spear come together to be whole. The Legends are now the proud owner of the Spear of Destiny. Mick goes to grab the spear but Rip stops him and tells the group that it will call out to people to get them to use it for their own gain. Rip says the spear needs to be destroyed and Mick uses his heat gun to try and blow it up. However, it doesn’t work. Rip knew it wouldn’t it as the spear can’t be destroyed as it will always heal itself. But Mick’s move does reveal writing on the wall that leads the team to seek the blood of Christ that is the only thing that can destroy the Spear of Destiny. Sara wants to go to the Crucifixion but Rip nixes that idea as it would have dire circumstances should something go wrong (and knowing the Legends, something always does). Instead, Nate determines that they need to head to 1916 France at the height of WWI and seek out JRR Tolkien (yes that one) who wrote an unpublished paper that contains the location of a vial of Christ’s blood. DC’s Legends of Tomorrow –“Fellowship of the Spear”– LGN215b_0070b.jpg — Pictured (L-R): Wentworth Miller as Leonard Snart/Captain Cold and Dominic Purcell as Mick Rory/Heat Wave — Photo: Cate Cameron/The CW — ÃÂ© 2017 The CW Network, LLC. All Rights Reserved. Rip and Nate get Tolkien out of the trenches and take him aboard the Waverider to cure his trench fever and to get his help in finding the location of the vial of Christ’s blood. Mick and Amaya are also searching for Tolkien and enter an infirmary tent. Amaya is shocked at seeing all of the injuries. When Mick is tasked with handing out bread to the patients, he sees Snart. Mick goes out to talk to him and Snart berates him for still being a part of the Legends. Snart tells Mick that the Legends don’t appreciate him nor trust him and call him a dog for following orders. Mick thinks Snart is all in his head and tells him the Legends plan on using the Christ’s blood to destroy the Spear of Destiny. Elsewhere on the Waverider, Amaya admits to Sara that she got Gideon to show her future and this has left her unsettled. Tolkien helps lead the Legends to Amiens and a church destroyed in battle. They noticed a weakened column and when Nate knocks it down, the find a skeleton and on his chest of armor is a map to the location of the blood of Christ. Interrupting them is Darhk and Snart. Everyone can see Snart who learn was plucked from the timeline before he joined the Legends. This Snart is disgusted at hearing his future fate. Darhk also spills the beans on how Mick told Snart the Legends plan to destroy the spear. Everyone is not happy that Mick told the Legion their plan but in his defense he thought Snart was all in his head. A firefight breaks out and the Legends have to flee but not before Tolkien gets a rubbing of the map off the armor. Back on the Waverider, everyone is pissed at Mick for betraying the team but again Mick thought Snart was in his head. In Rip’s office, the spear is calling to Amaya who is tempted to use it to save her future. Mick tells Amaya what he hears is his parents and would use to spear to fix his past. Meanwhile, Nate takes a look at the brass rubbing and determines the blood of Christ is in the middle of No Man’s Land. So Mick and Tolkien try to convince the British side to suggest a cease fire while Martin and Ray do the same on the German side so Sara, Amaya, Mick and Nate can get to the vial without getting shot at. Unfortunately, it doesn’t work. When the spear lights up, the quartet makes their way through No Man’s Land to the vial while taking on German soldiers. 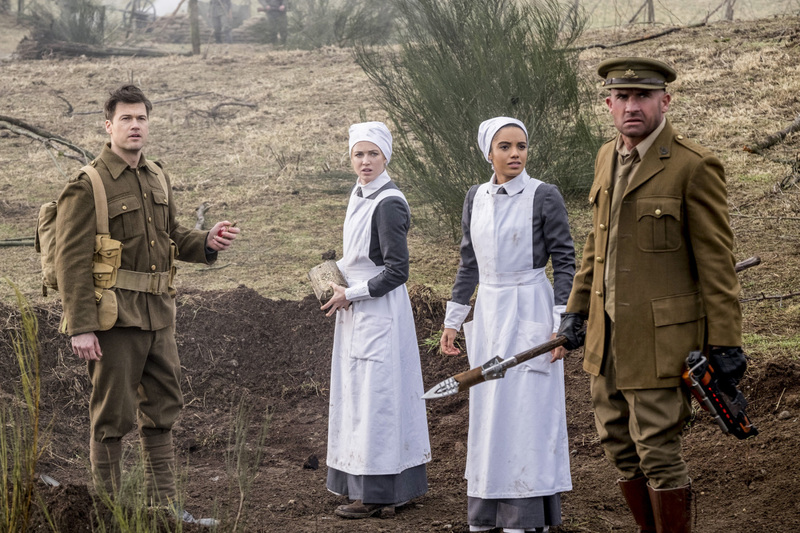 DC’s Legends of Tomorrow –“Fellowship of the Spear”– LGN215a_0140b.jpg — Pictured (L-R): Nick Zano as Nate Heywood/Steel, Caity Lotz as Sara Lance/White Canary and Maisie Richardson- Sellers as Amaya Jiwe/Vixen — Photo: Cate Cameron/The CW — ÃÂ© 2017 The CW Network, LLC. All Rights Reserved. Rip commandeers a radio and speaks to both sides for a cease fire so both can collect their injured and dead. It works and Sara, Amaya, Nate and Mick get to the vial. Sara hands over the spear to Mick as she goes to retrieve the vial. Unfortunately, Darhk and Snart are their too and manage to convince Mick to join their side and give the Legion the spear. Snart sets off a grenade putting an end to the cease fire. As the Legion leaves, Mick apologizes to Sara and tries to get Amaya to come with him but she refuses. Gun fire resumes, Sara, Nate and Amaya flee back to the Waverider. Unfortunately, the vial of Christ’s blood becomes a casualty of war as it gets destroyed. Back on the Waverider, the team is seemingly shocked at Mick’s betrayal but Ray isn’t so surprised considering they never fully trusted him. The Legends think hope is lost but Nate wants to think positively that even though the Legion has the spear they may not know how to use it. Over at the Vanishing Point, the Legion is celebrating their win against the Legends. Snart congratulates Mick for waking up to the truth and joining the correct side (but based on next week’s promo, it looks like he regrets it). Unfortunately for Nate, the Legion does know how to use the spear as Malcolm Merlyn comes back from wherever he was with what he calls the instruction manual for the spear. Malcolm starts saying an incantation and the Spear of Destiny does its magic.